Nick Clegg has revealed that he is an agnostic who remains open to the possibility of adopting faith, not an atheist as he has widely been regarded up to now. His remarks came as a public debate continued over whether Britain is a “Christian country”. The Deputy Prime Minister has consistently been described as an “atheist” since being asked in 2007 by the BBC if he believed in God and replying: “No.” But talking to The Tablet at an Easter reception yesterday, Mr Clegg described himself as an agnostic who left the door open to believing in God. David Cameron wrote in an article in the Church Times before Easter: “I believe we should be more confident about our status as a Christian country.” Following Mr Cameron’s remarks 55 well-known secularists wrote to the Daily Telegraph accusing the Prime Minister of sowing “alienation and division” with his remarks. This week Dominic Grieve, the Attorney General, said that although religious extremism discouraged some Christians from being open about their faith, Christianity was woven into the country’s fabric. “Many of the underlying ethics of society are Christian-based and the result of 1500 years of Christian input into our national life. It is not going to disappear overnight,” he said. Mr Clegg, whose wife Miriam is a practising Catholic, said that his own mother is a “devout Catholic” and that he attended Russian Orthodox services with his father’s mother as a child. 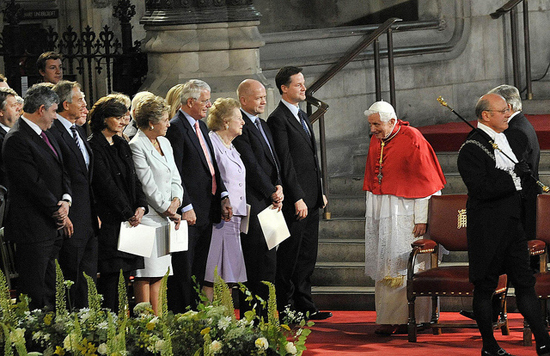 Top and above: Nick Clegg yesterday; when he met Pope Benedict XVI on his 2010 visit to Britain. As well as attending the Pope Emeritus' speech in Westminster Hall (pictured), Mr Clegg and Benedict had a one-to-one meeting. Photos: Crown Copyright, UK Parliament.